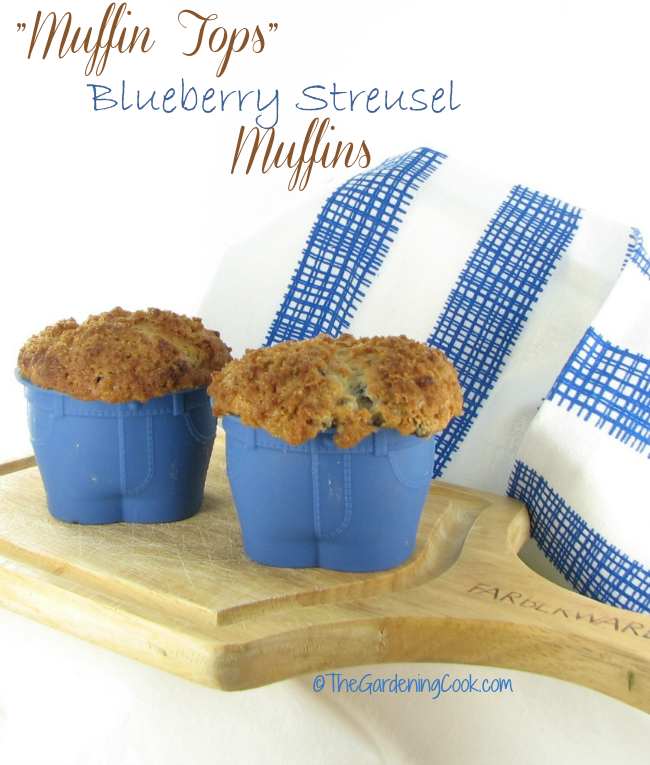 If you are looking for a really tasty breakfast on the go for those busy mornings, try one of these blueberry streusel muffin top muffins. 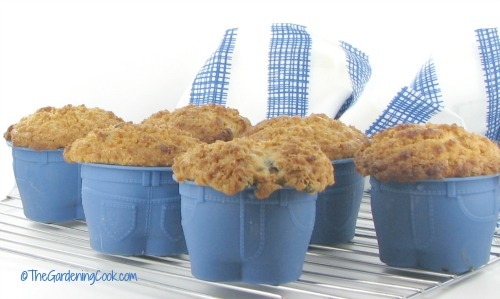 Blueberry Streusel muffin top muffins make a great breakfast treat. I made these muffins as a bakery store super sized recipe because I wanted to make them in a new product that I just discovered. 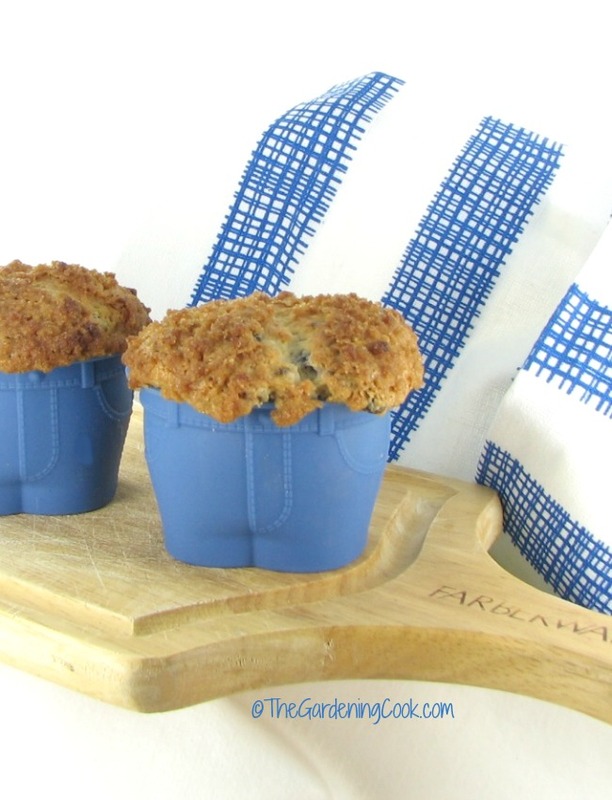 These sweet “Mr Muffin” muffin tops silicone baking cupsmake an over sized muffin. (affiliate link) The batter fills up the container and spills over to make a muffin top shape, which makes them perfect for the adorable jean shape on the bottom. In order for the muffin to spill over, you will have to fill the cups well. I put my batter almost to the top of the cup. All that was left to do was to sprinkle the streusel topping on the batter and bake them. I used about 2 tsp of the streusel for each muffin. When the muffins are done, let them cool for about five minutes before placing them on a wire rack to cool. Be sure to give them at least 15 minutes on the rack. The muffins will release a bit from the muffin cup and make taking them off easier. 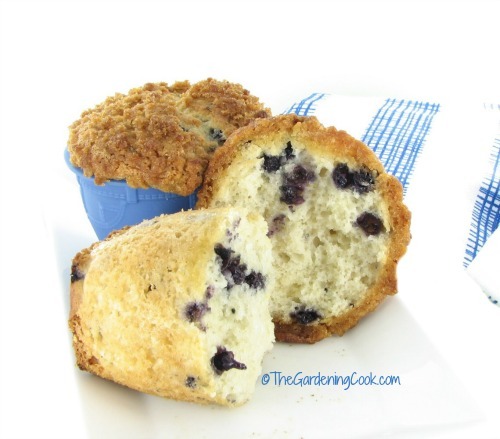 The muffins are super tasty, with the fruity flavor of fresh blueberries and perfect for your breakfast on the go. They are moist and delicious and really big. Just remember not to eat too many of these super sized delights or they might just give you a muffin top! Note: I received these Silicone muffin cups free of charge for mentioning them in my recipe. I only recommend products that I feel my readers will enjoy. I love these and hope you do too. For more breakfast ideas, check out these breakfast recipes. 2 tsp butter at room temperature. 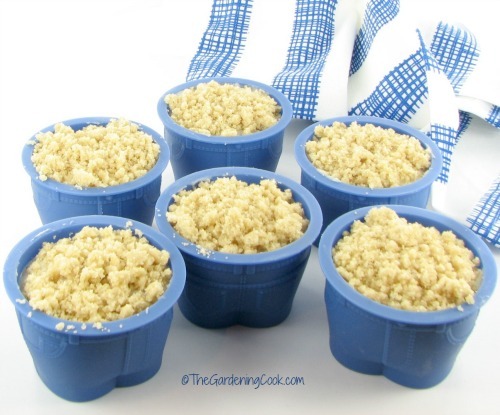 Prepare the streusel topping by combining the brown sugar, butter and flour. 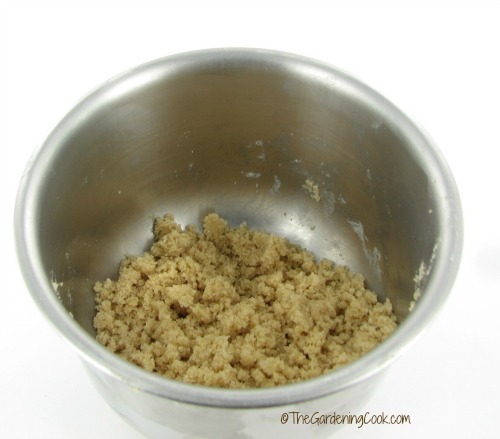 Mix with a fork and then crumble it with your fingers to make a coarse cornmeal texture. Set it aside while you make the muffins. In a small bowl, whisk together the flour, baking powder and Kosher salt and set it aside. In the bowl of a stand mixer, beat the butter and sugar until it is light and fluffy. Add the eggs, vanilla extract and milk. Add flour mixture and stir by hand until just combined. 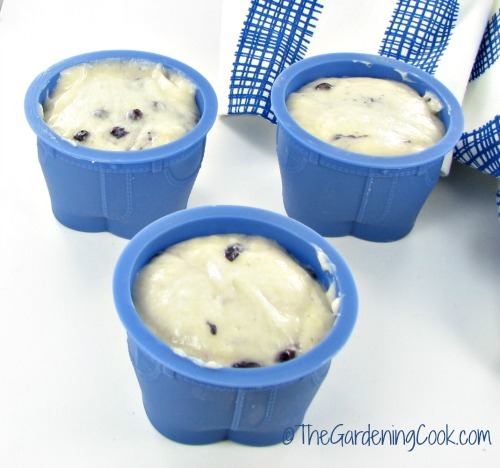 Divide batter evenly into 6 over sized Mr Muffin silicone muffin top cups. Be sure to fill the muffin cups well to get the muffin top when you are done. Sprinkle the muffins with streusel topping. Bake at 4000º for 25 - 30 min, until a tester inserted into the center comes out clean. When muffins are done, cool for a few minutes in the muffin cups before removing and then cool on a wire rack. OK, this widget is officially screwy. I had a problem on the thermometer widget. Hi Sarah. I have been having problems with all the Tomoson widgets. I’ll be using Rafflecopter in future. Can’t fix this one until the entry is over though. Sorry. Everyone else is in the same playing field though. Hi Emily. For some reason, the Tomoson widget is stripping out the Facebook part. But don’t worry, everyone is in the same boat. I have switched over to Raffle copter for future giveaways. It is much more reliable, I think. Sorry that you had this happen. Hope you win, though! They are the cutest ever muffin cups. Would love to win these!